After 5 days in Paris the countryside feels good! Even when there is nothing of conventional beauty to see, particularly this late in a grey, damp and cold day with the light going and the sombre feeling drawing the energy out of the drive home. Yet there is something to be seen; the way the trees, in their spare branches and woven asymmetries seem huddled against the season, or the diminished yet radiant tone of the colors of winter, or the flattening of the light lending a last, eerie, tincture of blue to the onset of nightfall. All this puts me in a reverie, and out of it I feel the freshening of my vision, the desire to look harder at what this moment of reality is offering me. Another call to wake up and see! 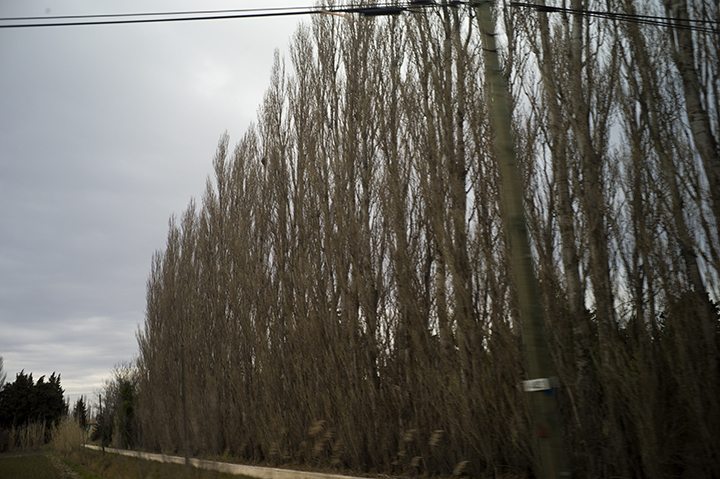 This entry was posted in Photographs from the car and tagged Dusk, France, From The Car, Provence on January 24, 2015 by joelmeyerowitz2014. Dear Joel, I’m enjoying your beautifully written observations and sublime photographs. Thanks. We live in a photo -saturated world. Articulating how we feel and see the world adds a dimensionality to this visual, solo, satisfying preoccupation.